As the manufacturing industry continues to decline, it can be helpful to look at regions where manufacturing is a real driver of the economy. A few months ago, we began looking at industry specialisms for the Government office regions around England. In the South West, the accommodation and food services sector is the most concentrated industry, while in the North East, the electricity, gas, steam and air sector is the bright spot. In this post, we will look at the North West, where manufacturing has the highest concentration. The manufacturing sector has the highest regional concentration score for the North West region. A regional concentration is a comparison of how concentrated an industry is in the selected region to how concentrated it is in the nation as a whole. (Regional concentration is the equivalent of our location quotient.) In this case, the manufacturing sector has a regional concentration score of 1.18, meaning that manufacturing is 0.18 times more concentrated in the North West than in the nation. The high level sector can be broken into its constituent 2-digit SIC categories. 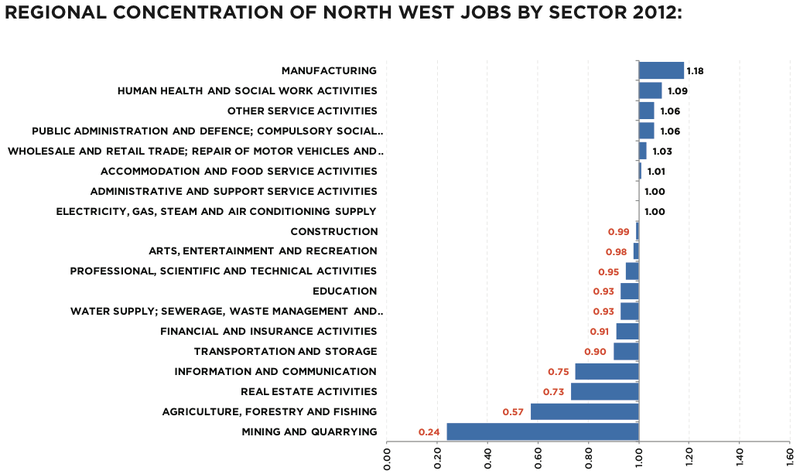 Within the North West region, there is a wide spread of jobs across the various classifications within the manufacturing sector. The largest number of jobs are found in the manufacture of food products, accounting for more than 15% of all jobs in the sector. The North West region can be broken into 13 constituent NUTS3 regions, the equivalent of Counties and Unitary Authorities. Employment in the sector is spread across the region, with the largest concentration of jobs being in the Lancashire and Greater Manchester areas. In order to understand the true nature of a region’s labour market, it is crucial to link occupational profiles to industrial profiles. Occupational change within the context of a specific industry can indicate changing skills requirements of an employer or industry within a region, which in turn can help to drive curriculum planning. The number of regional jobs are spread across the various occupations within Manufacturing, as would perhaps be expected in such a diverse sector. The highest number of jobs is found amongst production, works and maintenance managers, which account for 6.26% of all regional jobs in the sector. It is interesting to note the importance of ‘generic’ jobs such as marketing and sales managers and general office assistants/clerks in the top 20. Is the industry disappearing the North West? It certainly looks that way. And given how important the manufacturing sector is in the region, the North West is in for even more economic turmoil. Data for this post comes from Analyst, our web-based labour market tool. For more information about EMSI data, please contact Andy Durman. You can also find us on Twitter and Facebook.